Environmental design starts with the body as well as the site. In the course Cities and Bodies, taught by Global Urban Humanities Project Director Susan Moffat, students from a variety of disciplines are exploring the physical dimensions of urban form and experience. On September 27, 2016, choreographer Erika Chong Shuch and urban designer Ghigo di Tommaso led the class in exercises designed to sharpen awareness of how we use our senses to understand space and place. They also discussed their cross-disciplinary course Public Space: Placemaking and Performance. During the presentation, Chong Shuch said she was a performer who likes to make people feel uncomfortable. She described Di Tommaso as a urban designer who, by contrast, seeks to make people feel comfortable. Their presentation was focused on exploring and challenging our own feelings of comfort and discomfort in space. Chong Shuch and Di Tommaso began the session with a series of exercises designed to test our feeling of comfort in a group of people. Once we we had arranged ourselves comfortably on chairs in a circle, Chong Shuch instructed us to quickly move to something that was physically uncomfortable. Some placed chairs on their heads, carried many bags at once, or hugged a trash can while standing on a table. While unpacking the feeling of discomfort, people explained they felt “unfocused” and “antagonistic.” Chong Shuch then asked for everyone to remain in their uncomfortable position while trying their best to make themselves somehow comfortable. One person explained that she made herself comfortable by “becoming internal.” Another participant said that, to the contrary, sharing a gaze with another uncomfortable person was comforting to them. We moved on to exploring social discomfort. For most, social discomfort involved touching or looking at a stranger in a way more intimate than usual. Participants leaned on someone they didn’t know, squatted above someone lying down, and moved much closer together. One participant explained that as her body started working together with another body, she began to feel more socially comfortable than she initially had. In the next exercise we began by walking aimlessly around in a sea of people attempting to make meaningful eye contact. Chong Shuch instructed us to stop and make eye contact with one person with whom we would now be paired. 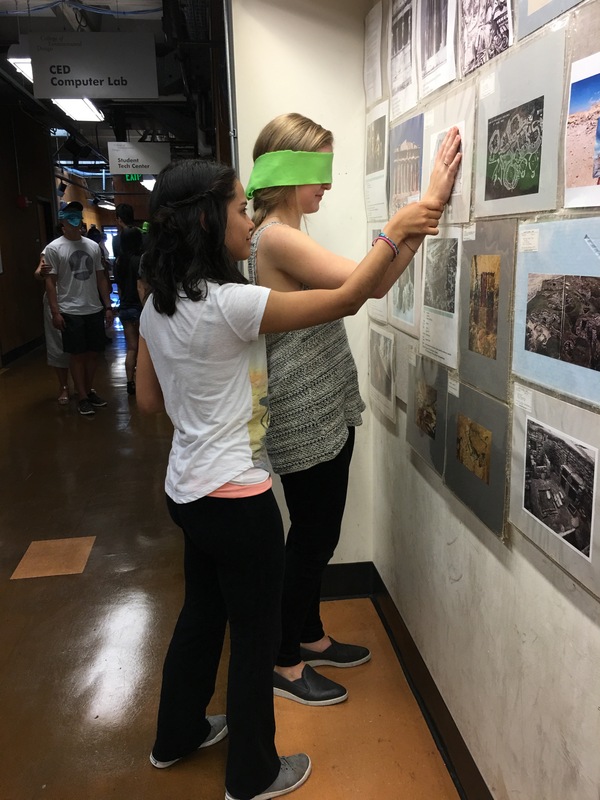 The exercise entailed one partner being blindfolded and the other leading the blindfolded. Throughout the entire exercise we were not allowed to speak to each other and were allowed only to guide our partners using touch. I was blindfolded first and my partner slowly began to lead me around the room, out into the hall, and into an adjacent room. As I gained trust in my partner we began to move more quickly. I touched the materials of the wall and room around me with my hands, and eventually I was led to sit down. We then switched places and I led my blindfolded partner around the room, feeling the walls and furniture, and finally to a seated position. The exercise had scripted moments in which Chong Shuch interjected and gave directions to the seeing partner. It also allowed for unscripted moments in which the partners were allowed to explore their own interpretation of the instructions.The exercise concluded with 2-minute free writes on the topics of protection, comfort, and delight. Di Tommaso and Chong Shuch explained that successful public spaces need to provide these elements. Di Tommaso and Chong Shuch then described a semester-long course in which they had employed exercises like this. Through team and individual experiments the students in that class created a provisional, working definition of the term “public space,” drafted and endlessly revised on a crowdsourced online Google Doc that was itself an experimental object. Throughout the session, although some of the exercises were uncomfortable to perform with a stranger at first, my feeling of comfort evolved. By the end of the exercises it no longer felt awkward to lead a blindfolded stranger across the room by holding their hand. The session ended with a general feeling of comfort. The most important lesson I learned from this presentation was the difference between social and physical discomfort in space, topics which are very applicable to my field of architecture. The exercises made me more questioning of the experience in public space, for example, how someone uses a bench. Say the bench is unused. It could be either due to social or physical discomfort and separating the two could be of use when studying it. The physical discomfort could relate to the feeling of sitting on it while the social discomfort is that it is too close to a busy street. If a designer is to assume it’s physically uncomfortable and simply replace the bench with a new, more comfortable one, they might miss the true reason it’s unused. I will now think of and use this distinction between physical and social comfort in both my studies and future practice.